Met amazing new and old friends Mishma, Joey, Shelly, Hazel, Tiffany, Lexie, and Katy! Also ran into Melissa (@miss_melissalee), Brittany (@bbookrambles), and Kaz Brekker. Got things signed by Maggie Stiefvater, Adam Silvera, Tochi Onyebuchi, E. Lockhart, Sarah Porter, Dashka Slater, and Megan Whalen Turner. Took a selfie with Adam and Marieke Nijkamp. 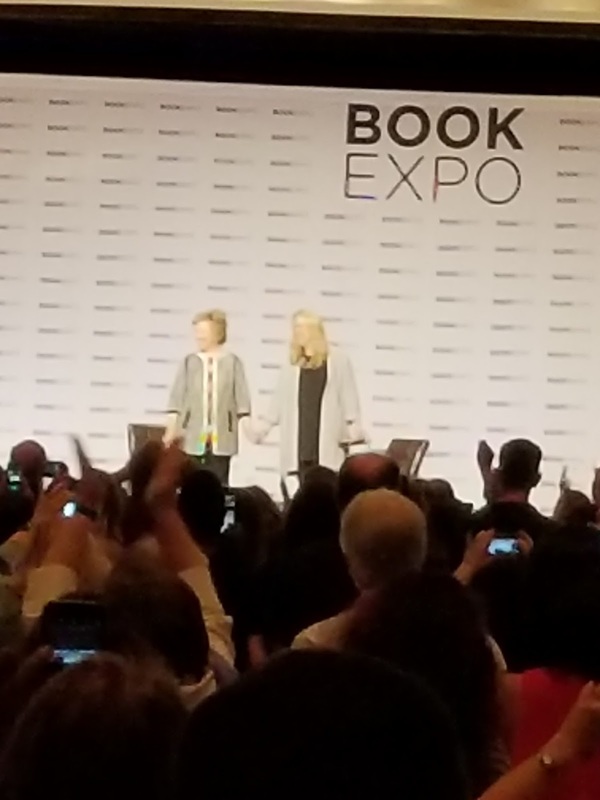 Got to see Hillary Clinton in person! And got a signed bookplate! Died. Had ice cream with Cale Dietrich, Vee, Sonia Belasca, and Christine! Left for the airport right after work! Started Roar by Cora Carmack, which was a lot better than I was expecting but also not quite as good as I'd heard. Love the magic though. 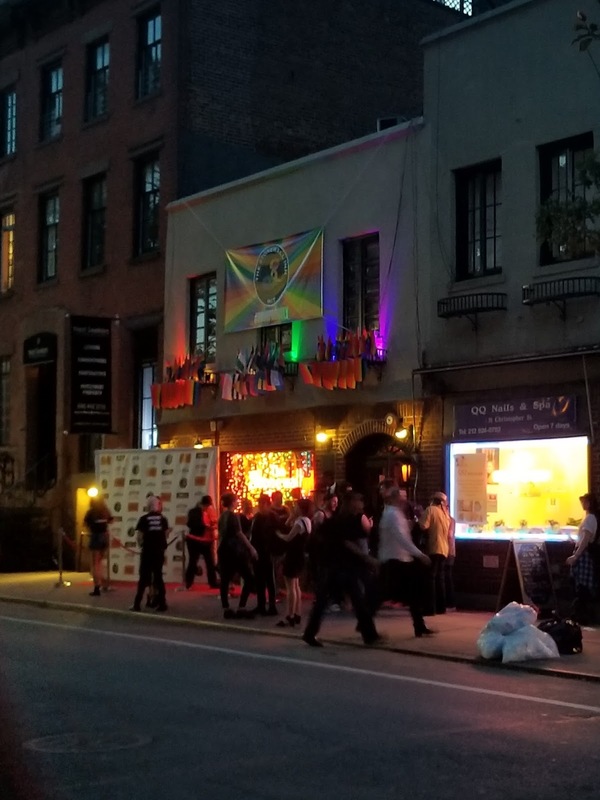 Got into NYC really late! Took an uber because there was no way I was taking the subway by myself at 11pm. Wandered the streets aimlessly for a minute looking for my hotel, which seemed to be named the wrong thing. 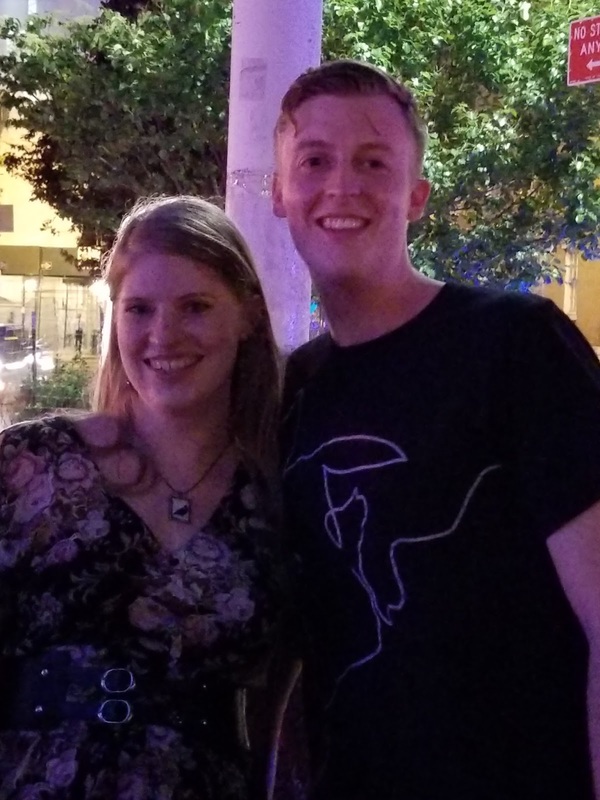 After DMing my roomie I'd hadn't met yet that I was there, waited stupidly outside the hotel for about ten minutes until the porter came out and asked if I was looking for their other hotel. Which also started with "Hudson" but was actually the name I'd been told. Went there. Met my roomies! I'd already met Mishma (@chasingfaes) last year, but I was super excited to meet Shelly (@shellysrambles), who I've followed online for ages, and their friends Joey (@afterthoughtan) and Hazel (@staybookish). The room was probably about the size of my dorm room with two full beds and a dresser. I'm still amazed that we all fit in it. We slept two to each bed, with Hazel making a blanket nest on the floor and all our suitcases and crap lined along the wall, stuffed into cabinets, poking out from under the dresser, and occupying the windowsill. Needless to say, getting to the bathroom in the middle of the night was an acrobatic challenge. We stayed up an hour or so making our schedules and gushing about how fun Day 1 was going to be. It was Joey's first BEA, so we attempted to warn him. No one can really be prepared until they see it. Bright and early! This was my fourth BEA, so I learned to cherish that extra sleep time instead of lining up two hours before the show floor opened. All five of us showered, brushed our teeth, and got dressed in our little room and tiny (single) bathroom, and somehow no one murdered each other. Time to divide and conquer! 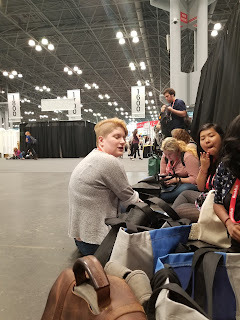 Shelly held down the fort in the main line while we camped out in the signing line for Maggie Stiefvater tickets. I know there's been a lot of talk about All the Crooked Saints, but I do love Maggie and I'll reserve judgment until the reviews come in from people who are closer to the rep than me. Mish, Joey, and I got the last three tickets somehow. The show floor opened! It was a mad rush inside, although not quite as hectic as in other years. 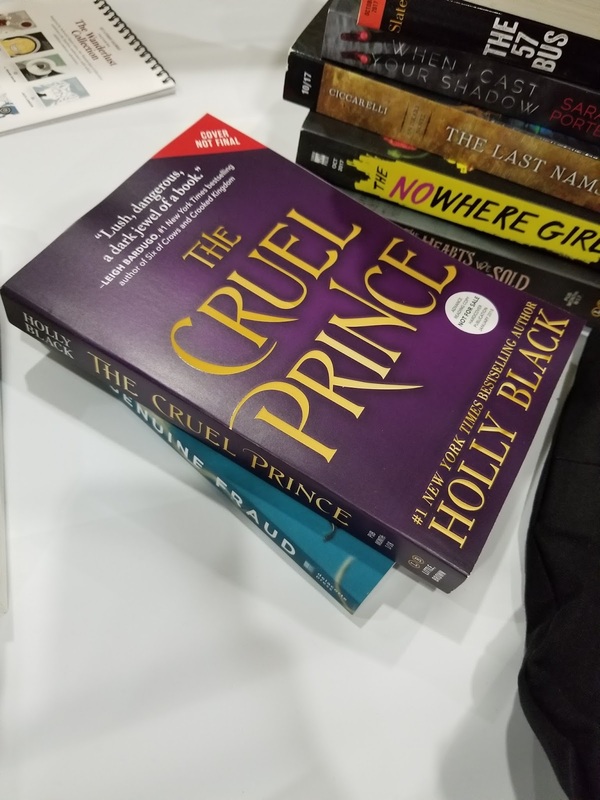 WE RAN TO A COUPLE DROPS (they had Cruel Prince by Holly Black, which was unannounced and a totally great surprise. The NOVL rep said it's even better than The Darkest Part of the Forest, which I adored). We also got THE MOST VALUABLE TOTE, aka the blue thing in the above photo from James Patterson. It's just better than other totes. Then we staked out our spot in the Maggie line. 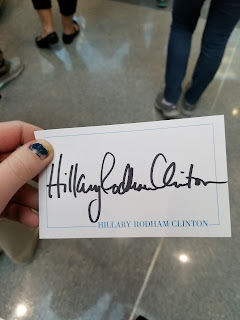 I meet up with the amazing Lexie (@prationality), who was kind enough to give me her ticket for An Evening with (wait for it) Hillary Clinton! 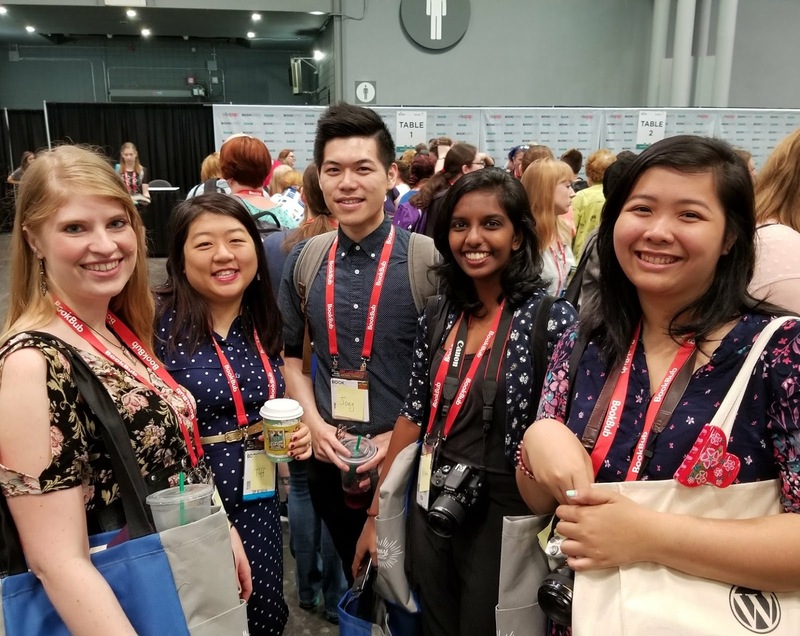 We also joined Tiff (@mostlyyalit), who I hadn't met but who is also lovely. We argued about the necessity of Robo Bee in the Raven Cycle. Tiff was before me and told Maggie that she would never understand Robo Bee. Immediately after, I declared to her that Robo Bee was the unsung hero of the series. Maggie seemed perplexed but amused. Probably thinking, "the hell are these people debating about Robo Bee?" I had a bunch of things scheduled, as usual, and, as usual, I kind of winged it until my next coveted thing. I met up with my lovely friend Katy, a publicist at Sourcebooks, and ran back and forth aimlessly with the Room 301 Squad (aka my roomies) getting schedules, chatting with publicists, and hovering around Macmillan for the Girls Made of Snow and Glass drop. Because of course they were noncommital about the line. This is a good time to mention that none of us brought a roller bag with us. So foolish... My shoulder is still killing me. We actually had lunch today! Overpriced cafeteria General Tso's chicken. Nom. Then it was time to go wait for Adam Silvera. The publicist warned us that there might not be enough copies for everyone in line, which made me cry inside because I've gotten both of his previous ARCs signed at both the BEAs he was at. But it was okay! We all got copies of They Both Die at the End, which I'm sure will kill me. Adam called Mish his BFF. He also managed to finish his signing in 45 minutes, which is a ridiculous improvement from his previous 2 hour signings. Apparently he told his publicist to rush him. Lol. We rushed to Penguin for Beasts Made of Night by Tochi Onyebuchi, which is a Nigerian-inspired dark fantasy about prison culture and magic. 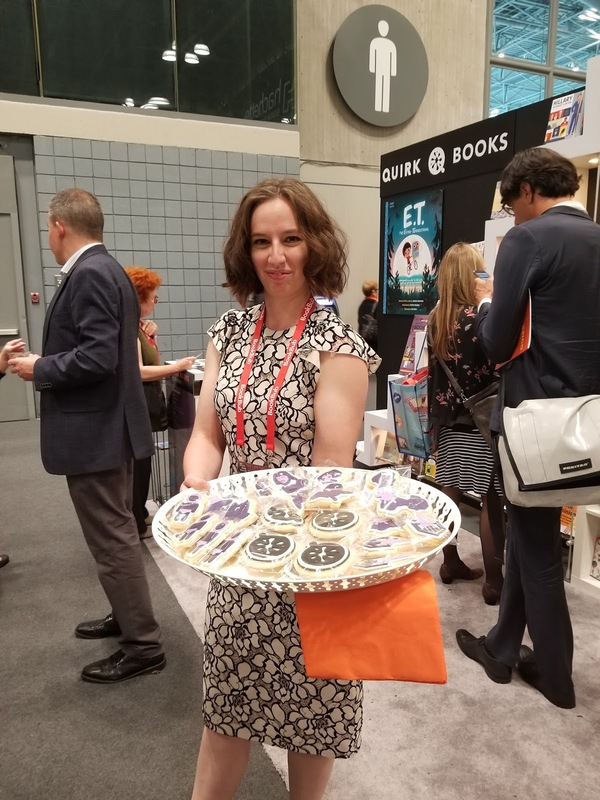 This was one of my absolute top picks for BookExpo. The author is absolutely amazing, one of those bright, bubbly people you feel instantly friends with. 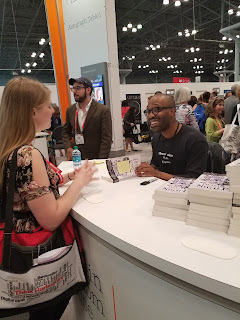 I asked him if his book was coming out on Halloween on purpose, and he joked that it was a quote-unquote-coincidence, and then we bonded over Halloween and the injustices of the prison system. I'm seriously losing my mind not reading this book immediately. 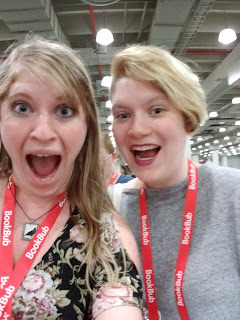 I wandered over to the E. Lockhart signing, because I loved We Were Liars and the premise for Genuine Fraud sound just as twisted. I asked her how much more this book is going to mess with my head. She said "a lot." I'm excited. Mwuahaha. We ran into Adam and Marieke Neijkamp and weirdly stalked them for a minute until they were done talking to some dude. Then we took an amazing group selfie because Adam has really long arms. Managed to hit both the lines for Sarah Porter's When I Cast Your Shadow and Dashka Slater's The 57 Bus! They haven't gotten much hype, but go check them out, because they both sound dark and fascinating. 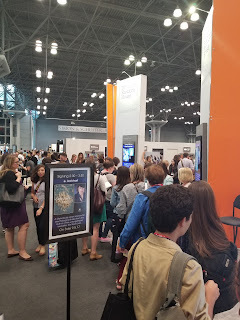 Decided not to go to Leigh's or Daniel Jose Older's signings (whimper), Leigh's because it was just a sampler and her line was insane, Daniel's because I still haven't read Shadowshaper because I'm a terrible person. But we passed Leigh, and she looked like a dark goddess. Went to the Harper drop for The Last Namsara and Release by Patrick Ness. The Harper publicist kind of scared me, because I am a wuss. But I got my Ness! All in all, it was a lovely day! There were a lot fewer people than in past years (possibly because of the absurd price hike, hem) and the people who were there just seemed more chill. 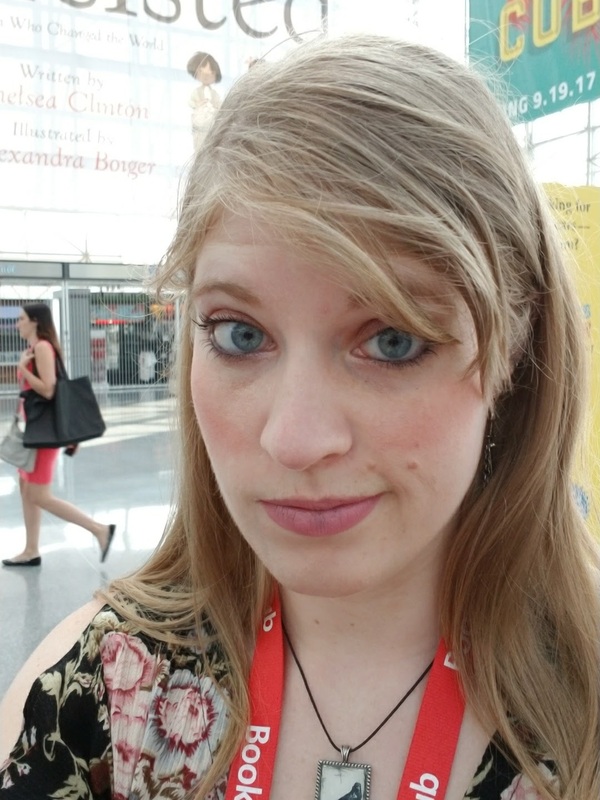 I didn't get trampled, there was room to walk, and I guess I just felt less hurried than in the past, and more confident. I've found my people! While the rest of the crew passed out, Shelly and I lined up in the ridiculous line for Hillary! Waiting was totally nail-biting, but then she came out and I basically cried (except not really because I'm not a crier). She was interviewed by Cheryl Strayer, who apparently wrote a memoir that everyone knows about but me. Oh god, I can't even describe how many chills I had during this hour. Hillary is so poised, dry, and witty! She stuck in a few clever cracks at You-Know-Who, my favorite of which was, "No, I didn't have time to read while on campaign. I had a huge stack of briefings to get through every night, because I had this old-fashioned idea you needed to know about policy." Then at the end (it came so quickly! ), the staff passed out HAND SIGNED BOOKPLATES SIGNED BY HRC. I know they weren't stamped because Shelly and I meticulously examined them and they had all the right bleed marks and inconsistencies of real ink. Also I sniffed mine. It still smelled like Sharpie. The festivities went on! We grabbed greasy wonderful slices of dollar pizza on our way to The Big Gay Ice Cream Shop near the famous Stonewall bar, where we met GayYA god Vee (@findmereading), totally sunshiney author Cale Dietrich (@caledietrich), Sonia Belasca, and Christine from Macmillan. Everyone but me got this dipped ice cream concoction called The Salty Pimp (which Cale had a lot of fun saying), and I got this key lime pie sundae that I could have eaten 10 of. 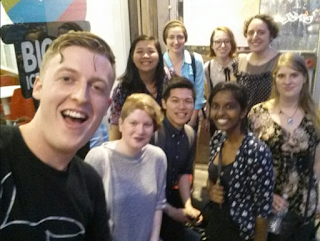 We spent a lovely evening chatting about books, video games, being awkward people. 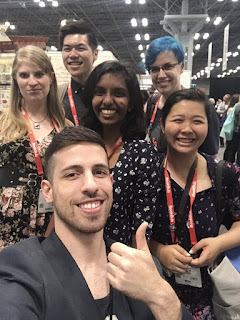 I really need to bump Cale's book up my TBR, because he's one of the bubbliest, most excitable, most delightful people. He's like a human golden retriever. Alas! Time for bed. Another night of schedule-making for Day 2, which we thought was going to be more chill. Oh, sweet summer children. I'm so glad to hear you got all the amazing books you wanted and enjoyed your 4th BookExpo!! I'm now living vicariously through your recaps! !